The figs were big orange beacons that lured me from afar. The snake was lime green and venomous and just centimetres from my face. I met them both near the top of a tree, about 35 metres above the ground in a Bornean rainforest. While the snake was safely coiled on a sturdy branch, I had only some sweat soaked fingers to save me from a fall. My heart raced. The snake’s unblinking eyes looked as patient as time. The year was 1998 and I was falling headlong into a fascinating story. Its stars are the fig trees — the 750 or so Ficus species. Over millions of years they have shaped our world, driven our evolution, nourished our bodies and fed our imaginations. The best could be yet to come. These plants could help us restore ravaged rainforests, limit climate change and stem the loss of wild species. They could build vital bridges between religions, and between scientific and faith-based worldviews. Their story reminds us of what we all share and warns us of what we could lose. But these plants are under threat. We risk running out of time to learn the many lessons they have to teach us. In Greek mythology a branch laden with sweet figs was among the temptations that teased the demigod Tantalus during his punishment in the Underworld. Each time Tantalus reached for the figs, a wind wrenched the tree’s bough beyond his reach. This tale gifted English the verb to tantalise. Those dull orange figs in Borneo, with their guardian snake, seemed set to elude me too. I hungered to have them, though I had no desire to eat their flesh. The figs adorned the stubby branches of a Ficus aurantiaca. This species relies heavily on primates to eat its figs and disperse the tiny seeds within. But in this particular forest Ficus aurantiaca was a plant with problems. First, there were few primates left in the area. The national park I was in was an island of ancient forest at whose edges lapped a sea of oil-palm plantations, farms, and logging concessions. These man-made habitats posed dangers to primates and other wildlife. Like the national park itself, they were often visited by shotgun-toting hunters for whom a monkey or a gibbon would be a prize kill. But even if primates had been abundant, something else was wrong. Like all fig species Ficus aurantiaca depends on a specific kind of tiny wasp to pollinate its flowers. That year, however, an intense drought killed off these insects. Across the national park the same problem had stricken many other species of figs too. No pollinators meant no seeds to create a new generation of Ficus plants. It meant no ripe figs to feed hungry animals. And that would have knock-on effects for the other plants whose seeds these creatures dispersed, and for the other animals that depended on those plants. The local extinction of tiny wasps had impacts that rippled across the forest ecosystem. That’s why the Ficus aurantiaca figs I spotted that day had made me incautious. I had never seen so many of that species before and I needed to know what was going on inside them. All that lay between me and my curiosity and the answers I sought was that poisonous snake and the risk of a long fall. I was hanging onto a ladder that somebody had attached vertically to the trunk of the tree. The ladder was the last of seven that stood toes-to-shoulders, each one flush to the tree. As I tried to maintain my grip on the metal rungs, an intense wave of vertigo paralysed me. For a moment I could no longer sense my own body. It was as if my mind was all that existed of me, and it scrambled to process the sudden danger. I held my breath. It was a long way down but I needed those figs and that meant I had to let go of the ladder with one hand to reach past the snake. Tantalus never got his figs, but I got mine. As I plucked each one and shoved it into my pocket, sticky latex — whiter than milk — oozed from the plant’s wounds. This gummy sap is common to all fig species. It deters insects from feeding on them and speeds recovery from wounds. Throughout history people have discovered ways to make the latex work for them. They have smeared it on branches to catch birds, curdled milk with it to make cheese, processed it to make rubber and used it as an aphrodisiac. I was glad of the latex that day. It covered my hands and strengthened my grip as I lowered myself down the chain of ladders and entered the murky forest again. The snake had not moved a single scale. It may seem strange to spend time and take risks in search of rare figs but by the time I met that snake in 1998 I had come to understand three things: that fig trees can play critical roles in rainforests and other ecosystems; that they have influenced the development of diverse human cultures; and that today we are both destroying the former functions and forgetting the latter. Back then the science was fascinating enough. But I was learning too about a chain of reverence towards fig trees that coils back in time for many thousands of years and encircles almost the entire globe. 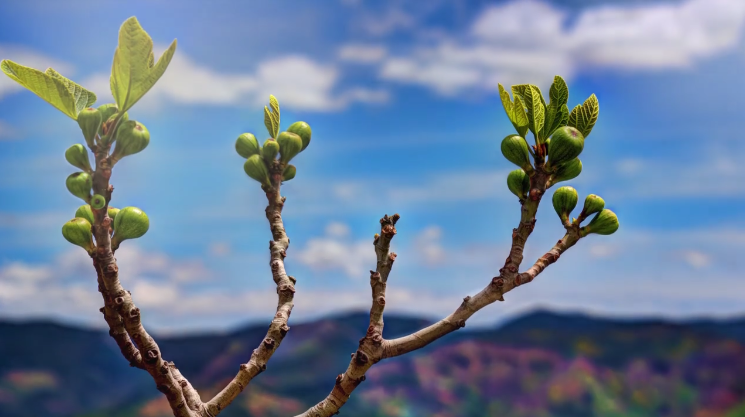 Fig trees appear in mythologies in the Amazon and in Africa, across the Mediterranean and the Middle East, and from the foothills of the Himalayas to the islands of the South Pacific. They feature in some way in Christianity, Islam, Buddhism, Hinduism, Judaism, Jainism and Sikhism. They star in the stories of Krishna and Buddha, Jesus and Mohammed and a host of other gods and prophets. Fig trees were inspiring, sustaining and even protecting our ancestors long before they invented writing or domesticated the dog. They were pivotal in the birth of agriculture nearly 12,000 years ago and are among the most nutritious of foods we eat today. Our shared story stretches back beyond the origin of human settlements, back to before the birth of our species, and back to before the day our ape-like ancestors descended from the trees and walked upright for the first time around seven million years ago. In fact, fig species had begun to interact with our ancestors long before they climbed the trees in the first place — back when the closest things to modern humans were the small shrew-like creatures that scampered in the shadows of the dinosaurs. Ladders to Heaven explains why. It is a story of life and death and of a deal undone. Its cast includes kings and queens, gods and prophets, flying foxes and botanical monkeys. It features scientific wonders and religous miracles all born from biology that seems almost impossible in its elegance. Most of all it is a story about the connections between humanity and nature, and what the loss of those links can mean. The story stretches back tens of millions of years to the age of the dinosaurs but is as relevant to our future as to our past. As our planet’s climate changes and reminds us that nature really does matter, the story has important lessons for us all. Mike Shanahan is a freelance writer with a doctorate in rainforest ecology. He has lived in a national park in Borneo, bred endangered penguins, investigated illegal bear farms and produced award-winning journalism. Mike is currently funding his book Ladders to Heaven with Unbound. You can support his book and get your name in the back here.